Dr Wakefield: "I am extremely disappointed"
The doctor who first suggested a link between MMR vaccinations and autism acted unethically, the official medical regulator has found. 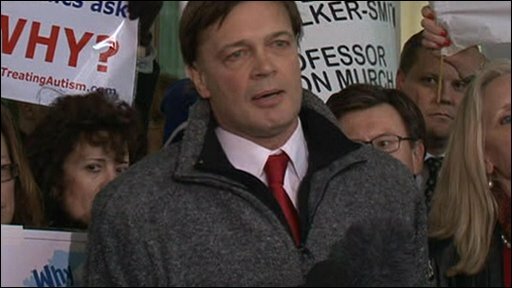 Dr Andrew Wakefield's 1998 Lancet study caused vaccination rates to plummet, resulting in a rise in measles - but the findings were later discredited. The General Medical Council ruled he had acted "dishonestly and irresponsibly" in doing his research. Afterwards, Dr Wakefield said the claims were "unfounded and unjust". 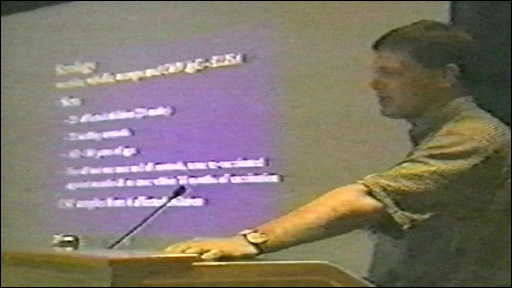 The GMC case did not investigate whether Dr Wakefield's findings were right or wrong, instead it was focused on the methods of research. During the two-and-a-half years of hearings - one of the longest in the regulator's history - he was accused of a series of charges. Two of Dr Wakefield's former colleagues at the Royal Free were also ruled to have broken guidelines. The panel chairman was heckled by supporters of the doctors during his delivery of the verdicts. One woman shouted: "These doctors have not failed our children. You are outrageous." Another person in the public gallery said it was a "kangaroo court". A small group of supporters also expressed their support for Dr Wakefield and his colleagues outside the GMC's London headquarters. Joan Campbell, 51, from Glasgow, who believes the MMR jab caused her son to develop autism, said: "It is atrocious. They were just trying to protect children." After the hearing, Dr Wakefield, who now lives and works in the US, said: "I am extremely disappointed by the outcome. "The allegations against me and my colleagues are unfounded and unjust and I invite anyone to examine the contents of these proceedings and come to their own conclusions." Referring to the parents who had supported him, he added: "I want to reassure them that the science will continue in earnest." The GMC now has to consider whether Dr Wakefield's behaviour, and that of his colleagues, amounts to serious professional misconduct and then if any sanctions should be imposed, such as striking them off the medical register. However, a ruling is not expected for some months. Medical experts said it was now important to move on from the controversy and remember that plenty of research had supported the use of the three-in-one jab. Dr Shona Hilton, of the Medical Research Council, said: "We need to continue rebuilding trust with parents that MMR vaccination is safe."